We are a specialist for winter activities in Albania creating amazing experiences for special people, like you! Albania is a great undiscovered place as a winter holiday destination specially because of the untouched nature and the amazing landscape. If you like snowshoeing or ski touring to remote places, enjoying tranquil and serene moments in harmony with the local nature away from the crowd, than Northern Albania is the place to be. 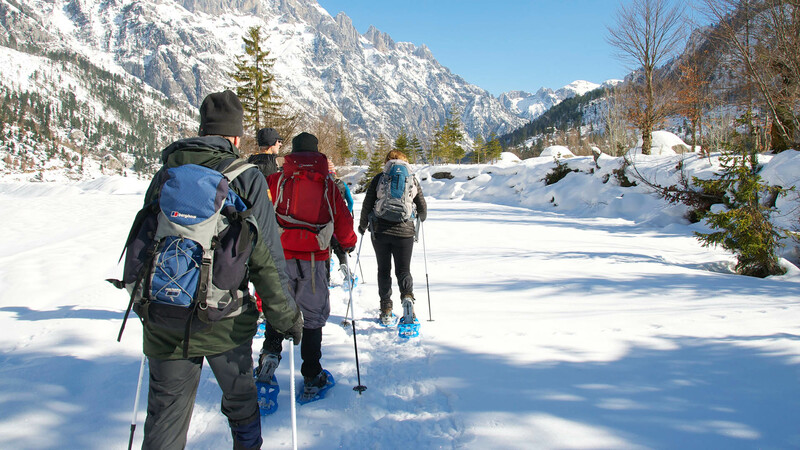 Our guides will take you through some of the most breath-taking snowshoeing routes and landscapes of Valbona and Padesh Valley. Snowshoe through Albania and Kosovo. Our "Snowshoeing in Albania" tour will take you to the best snowshoeing routes in the Albanian Alps. Along the way, you'll enjoy both the fantastic mountain scenery and the delicious homemade food that Albania and Kosovo have to offer. Escape the crowds and immerse yourself in the local culture, history, and natural marvels of Northern Albania! Our Snowshoeing Tour in Kosovo, Albania and Montenegro is the ideal winter break for those who would like to experience the untouched landscapes of the Western Balkans during the winter time. You will be snowshoeing along scenic routes of these three countries. Along the way, you’ll taste the delicious culinary delights of Balkan Cuisine. Snowshoe through Montenegro, Kosovo and Albania. The Mountains encircling southern Montenegro, eastern Kosovo and northern Albania are perfect for winter activities and deep snow exploration. Our local guides who work as ski instructors in Montenegro and Kosovo will guide you through some of the most scenic and untouched winter routes in the Balkan. This is your chance to get away from the crowds and experience the beauty and rugged landscape of the Alps.